A jewel on the Caribbean coast, the Yucatan showcases the very best in culture, cuisine, and history. Taste a delicious array of flavours while recharging from an invigorating day of exploring Mayan temples. Dip your toes into the turquoise waters of the Caribbean as you stroll from the sandy shores of Mexico to the coral reefs of Belize. Learn about ancient Mesoamerican cultures by day while discovering a world famous hospitality and meeting friendly locals by night. Our Yucatan tours start in Mexico and end in Belize, and are a match made in heaven for those who like an equal blend of history, scenery, and friendly interactions. Our Yucatan tour hits the ground running with a guided tour of Chichen Itza within the first tour day. It's a wonderful archaeological site incorporating the ruins of two different cultures, the ancient Maya and the later arriving Toltecs. The Maya originated in the Yucatan as early as 2600 BC but really thrived around 250 BC. Their empire stretched throughout Central America, from Mexico to present day Guatemala, western Honduras, El Salvador, and northern Belize, and we're pleased to take in several small private tours around some of the most prominent and important sites within the area. Our tour will visits a wide range of monuments from the Maya. At Chichen Itza, we explore the Temple of the Warriors and the ball courts. At Uxmal, a city the Maya abandoned and returned to again and again over the course of their civilization, we'll journey to the Palace of the Governor which is considered by many to be the most beautiful of all the Maya structures in Central America with 20,000 hand cut stones being set into acres of geometric friezes. Whether walking or biking, it is hard to comprehend just how massive the site of Coba is, a ruined city that holds the tallest pyramid in the Yucatan. In Tulum, marvel at the cliff-side temples while gazing into an impossibly blue waters that lap at the white sandy shores. More than just temples, a visit the port town of Chetumal displays the Mayan dominance on trade for goods such as cacao, gold, and copper. We wrap up our Mayan experience up with a visit to Belize's Lamanai, a ceremonial capital for the Maya that dates back to 1500 BC. More than just the Maya, this tour showcases a beautiful landscape with rich biodiversity. Crystal clear rivers lined with hardwood trees, orchids, and bromeliads. Palm fringed beaches that are postcard perfect. Inland waterways that are a resting point for thousands of migrating birds such as kites, tiger-herons, snowy egrets, ospreys and the rare Jabiru stork. Yucatan tours are a truly insightful look into one of Central America's most important indigenous cultures, and a way to gain a personal perspective on one of the world's most exciting destinations. Today we arrive in Cancun on the Yucatan Peninsula. Today we travel to Chichen Itza. This is a wonderful archaeological site incorporating the ruins of two different cultures, the ancient Maya and the later arriving Toltecs. The substantial fusion of highland central Mexican and Puuc architecture make Chichen Itza unique. The El Castrillo, the temple of Panels and the Platform of Venus are superb architectural feats. The most impressive monuments here are the Temple of the Warriors, the group of a thousand columns, the Temple of Kukulcan, the Temple of Chac-Mool and the Ball Court. The Toltecs interest in astronomy and mathematics is evident with a visit to the Astronomical Observatory, perhaps one of the most impressive revelations is the phenomenon occurring during equinoxes, when shadows cast across the ramp of the castle appear to form the shape of a slithering serpent. Tonight we include a visit to the Sound and Light show. Today we drive to Merida, probably the most beautiful town in the Yucatan peninsula. We find that the most enjoyable way to sightsee is from a calesa, or horse drawn carriage. We include a half-day's sightseeing in this most elegant of fashions. During the nineteenth century, European traders flocked to the bustling city to exchange their luxuries for the area's much sought after sisal hemp. The state capital's many buildings and the Moorish and rococo-style mansions of the Paseo Montejo reflect the strong Old World influences. Uxmal is a stunning place. 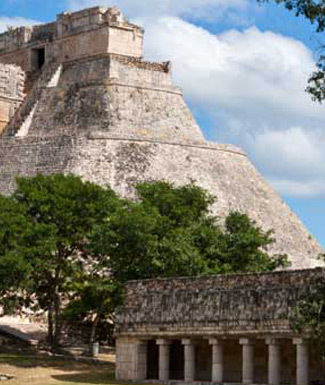 Uxmal was one of the sites to which the Maya returned again and again in the course of their civilization. The name means 'thrice built'. The Palace of the Governor at Uxmal is considered by many to be the most beautiful of all the Maya structures in Central America. Here some 20,000 hand cut stones have been set into acres of geometric friezes. The nunnery is the quadrangle where vestals allegedly spent a licentious final year of worldly pleasure before their sacrifice to appease the rain god Chac. This truly is a step back into the years of the Maya glory (AD 7-10). The Palace of Large Masks with its magnificent stone mosaics and representations of the ubiquitous rain god. We also visit the nearby smaller sites of Kabah and Labna. Kabah is the most notable for its Palace of the Masks, the facade of which is covered with innumerable carved masks of the rain god Chac. Labna is another beautiful site. It is famous for its fine sculpture and its arch, this was one of the most ornate built by the Maya. Today we depart Uxmal for Coba. The morning's drive takes us through Valladolid where we stop for our lunch break. The peaceful Zocalo in the heart of Valladolid is shaded by large trees and surrounded by a variety of restaurants. We continue on to Coba, one of the grandest Mayan city-states, and have a tour of this impressive site immediately upon arrival. As a large trading center, Coba was connected to other Mayan cities by an elaborate network of roads known as "sacbes". The ancient temples are still surrounded by the thick Yucatan jungle which adds a lot of natural flavour to a rich cultural experience. After our guided tour you may choose to rent a mountain bike available at the site. A bike is the quickest way to reach some of the most remote parts of this enormous ruined city that once rivalled Tikal in size. Because our hotel is so close to the site you may choose to stay in the site and climb up Nocoh Muh -- the tallest pyramid in the Yucatan. Watching the sun set from the top of this Mayan pyramid over an endless stretch of forests is truly one of Mexico's most magical experiences. In order to beat the crowds, we depart early today for Tulum, one of the most beautiful Maya sites, perched high on the cliffs above the Caribbean. Tulum means "wall" in Maya. The most impressive site at this area is the large Pyramid on the edge of the cliff overlooking the sea. A wide staircase leads to a two-chamber temple on the top. Two serpent columns divide the entrance and above the middle entrance is a carved figure of the Diving God. The sight at the top of the pyramid is stunning with a breathtaking view of the ocean and surrounding jungle. You will have free time to explore this site on your own. Tulum was once considered to be as grand as Sevilla in its day (ca. 1500). Our journey continues on to Chetumal travelling along the edges of the Sain Ka'an Biosphere Reserve, a vital preserve for the rich flora and fuana of the region. Chetumal, the capital of the state of Quintana Roo was once a Mayan port for shipping gold, feathers, cacao and copper from this region and Guatemala to northern Yucatan. The town's name is derived from the Mayan Chactemal, meaning "Where the Red Trees Grow." The trees referred to were once used to produce a red dye for use in weaving. We visit the Museum of Mayan Culture, where we learn how the Mayans were the dominant culture in the area for over 100 years. The museums highlights aspects of Mayan society, mathematics, cosmology and astronomy. After crossing the border into Belize we have an excursion to Cerro Maya. We leave Corozal aboard a small boat and travel across the bay to Los Cerros, one of the oldest commercial sites dating back to 400 BC. Today we travel south via the Crooked Tree Wildlife Sanctuary. The sanctuary is a large reserve covering inland waterways, logwood swamps, and lagoons. It is ideally located as a resting point for thousands of migrating birds such as kites, tiger-herons, snowy egrets and ospreys. The reserve's most famous visitor is the rare Jabiru Stork, the largest flying bird in the New World with a wing span of 2.5 m/8 ft.
We will also stop at Altun Ha, an important ancient trading centre as well as a religious ceremonial centre. We see a concentration of structures including plazas surrounded by palaces and temples. Over 300 jade pieces have been discovered including the largest Mayan jade carving, Kinich Ahau, the sun god, found in the Temple of the Green Tomb. Today we explore one of the many temples or palaces of Lamanai. Travelling via the Northern Highway, we pass through rural villages and lowlands to Tower Hill, where we board a riverboat and head up the New River. While traversing the many little creeks and lagoons, it is easy to encounter birdlife including hawks, kites and falcons. Dainty Jacanas lightly walk on the lily pads while the elusive crocodiles bask in the morning sunlight. The river is lined with hardwood trees with lots of orchids and bromeliads. At the entrance to the New River Lagoon, the ruins of Lamanai (Mayan for submerged crocodile) rise into view. Once at the site we tour the small museum which features many ancient relics found at Lamanai. This ancient archaeological site reveals a civilization that is known to have occupied Belize as far back as 1500 BC. Among the most spectacular of these archeological wonders is the ruins of one of the Maya's largest ceremonial centers and home to several large temples located on the banks of the New River Lagoon. The Lamanai Archeological Reserve also contains a museum, the remnants of two 16th century Spanish churches and a colonial sugar mill from 1860. We then return to the river boat for cruise back to Tower Hill and continuation tour bus drive to Belize City. Early this morning we visit the world famous Belize Zoo. A highlight of any visit to this little country, the zoo allows us not only to see some of the rare creatures of Central America but the zoo is actively involved in conserving habitat for these species and part of our entrance fees go towards ensuring that the wild relatives of these now caged animals can live free. We continue to Belize City to connect with our 45 min water taxi to Cay Caulker. On early British maps the island's name is spelled "Cay Corker." Known historically for its plentiful supply of exposed fresh water at La Aguada, one theory holds that this island was a favourite stop for sailors to replenish and cork water bottles. The Spanish name of the island is Cayo Hicaco, which means "the island of the cocoplum." "Caye Caulker" could be an anglicized pronunciation of Cayo Hicaco. Another theory is that boats were caulked in the protected bay, La Ensenada, on the western side of the island leading to the "Caulker" name. Despite the growth of tourism, Caye Caulker remains a small village with a distinct cultural flavour not necessarily found in large-scale tourist development. Almost all the businesses are locally owned, vehicles larger than golf carts almost never roam the streets, and lodging is small scale compared to many other tourist destinations, including neighbouring Ambergris Cay. Today is at leisure to enjoy the barrier reef, located just off shore, or to just sit and relax in the tiny island's legendary tropical atmosphere and friendliness. Your Tour Leader can you help you plan your day. Today we fly to Belize City to connect with our onward flights. Departure from Belize City. LAND ONLY CLIENTS: Your flight out of Belize City, the tour end point, should take into account the trip from Cay Caulker. Those with morning flights may have to overnight in Belize City at an extra cost. 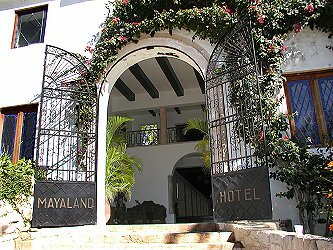 The Hotel Mayaland sits on 100 acres of beautifully landscaped gardens in the heart of the archaeological park, with its ...	entrance to the Maya temples. 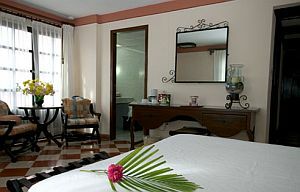 Built in 1930 by the Barbachano family, the hotel has been totally refurbished. Swimming pool, air-conditioning in all rooms, ceiling fans in all rooms, 4 restaurants on site. The beautiful old family home of Fernando Barbachano Peon, pioneer of Mexican tourism, now the Casa del Balam Hotel is ...	delight. A quiet blend of Mexican tiles, terra cotta, wrought iron, a pretty pool, restaurant, bar, 43 spacious junior suites in an old walled garden, situated on what has now become the most convenient location of the city. The intimate colonial ambience enhanced by cordial service makes it our first choice. Built in 1950 and lovingly maintained by the Fernando E. Barbachano family, Hacienda Uxmal is located within easy walking distance ...	the spectacular ruins of Uxmal. 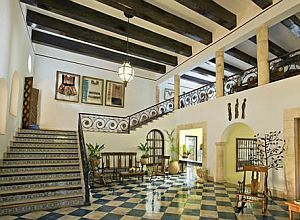 There are 80 rooms each with a view of the pool courtyard greenery.Room interiors are spacious with traditional Yucatecan tile floors, native furnishings using indigenous woods and local artistry. Private baths, full air-conditioning, and satellite TV ensure comfort. All rooms open to either a terrace or entry hall/verandah. 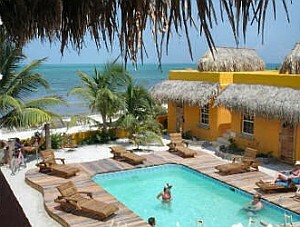 The hotel architecture blends Belizean and Mexican styles with the use of thatch, local woods and bright colours. The interiors ...	cool and modern with artwork from Belize and other parts of the Caribbean. Freshwater swimming pool. The beautifully decorated cabanas feature remote controlled air conditioning, cable TV, fridge, and bathroom with shower. Breakfast and dinner daily (hotels and local restaurants). All transport, sightseeing and entrance fees for sites noted as 'visited' in the detailed itinerary. Gratuities for local guides, drivers, restaurant staff, hotel porters (if available). Airport transfers for land & air customers and for early arriving / late departing land & air customers who book their extra hotel nights through us. International airfare to/from the tour. Tour Leader gratuity, lunches, drinks, personal items (phone, laundry, etc), departure taxes, domestic and international air taxes (if applicable). Airport transfers for Land Only customers. Optional trip cancellation insurance. Our post-reservation trip notes offer further guidance on not included meal costs, and shopping. YUCATAN: the warm dry season is Dec-May though temperature differences between seasons are slight. BELIZE: the main dry season usually extending from Feb-May. The coolest months are Nov-Jan.
Road transport by private air-conditioned motor coach, 12-30 seats depending on ultimate group size (see 'group size'). The region's roads are generally good and the distances covered are not great. Numerous nature walks and walking tours on uneven surfaces. Internal flights via scheduled carriers. Well-located, air-conditioned, mid-range (3-4 star) hotels with en suite toilet and bath throughout (probably shower only). Single rooms are limited and likely smaller than doubles. Hotel porter service is sometimes available (see 'Inclusions') though you should be independent with your luggage, especially at airports. Most hotels have outdoor swimming pools. Tour Leader, driver/s, and local step-on guides at various locations.